Excuse me Sir, do you have the time? I am sitting here blogging in the best spot ever! On my couch, watching Ellen's birthday episode! Haha! I just LOVE her show! Every day. You know how people say when you work out you have to turn it into a lifestyle? Well...I maybe haven't mastered that yet...but watching Ellen is a lifestyle for me. If you haven't watched her...you need to! This week I have been working on elapsed time with my students. For most of the first day or two we used their small dry erase boards to work out elapsed time problems that I was writing on the smart board. I tried a new technique this year ... don't tell them how to do it beforehand and see what happens! I tried this because time is something that students are familiar with... even though they may not realize it yet. I put a problem on the board and then I let them solve it however they want. So your question probably is...why is she blogging about this? Answer - I was amazed at what my students were able to do!! I absolutely loved walking around and seeing what techniques the students were coming up with. I have not been giving them enough credit, obviously, because it is like they don't even need me! They did such an awesome job! It is 3:16 now. What time was it 2 hours and 22 minutes ago? 6 - 2 is 4 ... 1 - 2 you cannot do, so the student changed the 3 hours to 2 hours and the 1 to a 7. This amazed me because this student knew not to carry over 10 and change the 1 to an 11...instead, he knew he was carrying over 6 (because there are 60 minutes in an hour), and changed the 1 to a 7... AWESOME that he knew to do that on his own! So, 7 - 2 is 5 ... 2 - 2 is 0 ... Zero in "time" is like saying 12. The board with the blue writing did what I would have done if I were solving this mentally, except she showed her work. Starting with 3:16 she showed a loop to the time that is 2 hours prior to 3:16...which is 1:16. Then she went back 22 minutes to get to her answer. It is 9:17 now. What time will it be in 3 hours and 59 minutes? The student who wrote in red is the same student in red in the first problem, so his work is done in the same technique as above. The student with the black marker shows a similar technique to our blue marker in the prior problem. Starting with 9:17 and going over 3 hours, then 59 minutes. (Which he explained as going 1 hour and subtracting one minute). The student with the pink marker skipped showing some work because a lot of it was in her head. I am okay with mental math as long as I can follow their thinking path, like I can with this work shown in pink. You can see that she ignored the 3 hour increase in time at first, by just worrying about the minutes (adding 17 and 59). Knowing that 76 was the total minutes we would have, she then added the 3 hours in her head (thinking "noon" out loud while she was at the board). She took away the 60 minutes, changing her hour time to 1:00. The minutes she still had left, she added to the 1:00 time, getting 1:16. The purple marker did her work just like the problem in the black marker, but just showed it in a different way. Because she went this route, she ended up with 12:76 which she knew was not correct. She changed it to 1:16 mentally. It is 8:36 now. What time was it 4 hours and 49 minutes ago? I will let you check out their work to see what technique they used! Something I learned from this is that my students have enough number sense to try their own techniques sometimes. I think I will start each unit from now on with a few minutes of letting the students "try things" on their own to see if they can find solutions. Something Old, Something New, Something FREE! Not to rub it in...but I have had a 5 day weekend this weekend! It is like a Spring break in January! I got to meet my brand new niece for the first time!! I am SO in love with her, it is ridiculous!! 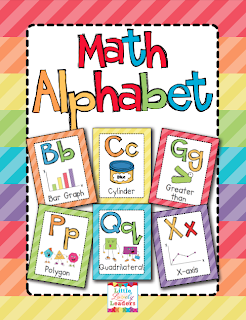 Well recently I received a special order for a version of this math alphabet, but for the primary grades. The wonderful teacher who requested this even sent me a list of the words she wanted for each letter! 2. The capital letters on each card are in purple, and the lower case letters are green on all cards. Other amazing teachers have mentioned their ideas to me and I just LOVE LOVE LOVE hearing what you all do with these posters in your classroom! 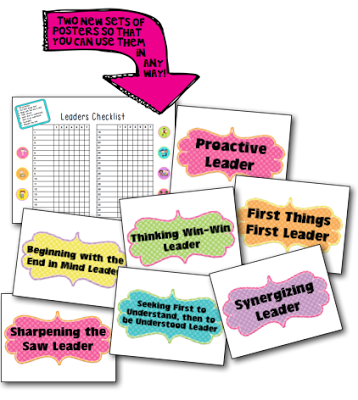 Let me know if you can get creative with these posters in your classroom! I would love to hear how you use them. I am super excited about this product because I just love it so much! I have a slight obsession with math...and every teacher loves an alphabet over their white board, right!? 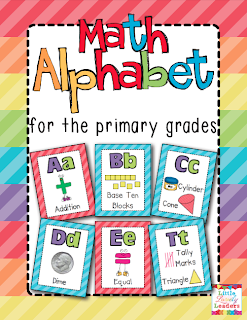 this Math Alphabet for Primary Grades! What time is it? Product Swap time! Click on the image below to check out all of the bloggers taking part in this product swap! I have been looking forward to this day for a few weeks now because I have been so excited to tell you about this amazing product! 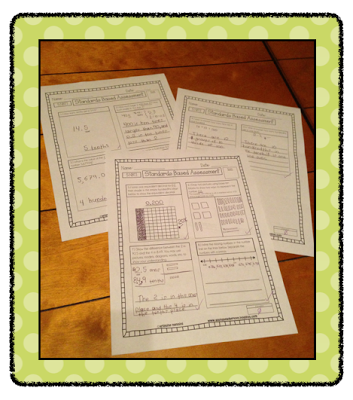 Kristine over at Young Teacher Love has created a fabulous math product that has me SO excited to go Common Core! I am just obsessed with ALL of her stuff! It is truly incredible because all of her products are SO full of useful pages! I have never had a product where EVERY SINGLE PAGE is useful for me...Until NOW! Thanks Miss Nannini! 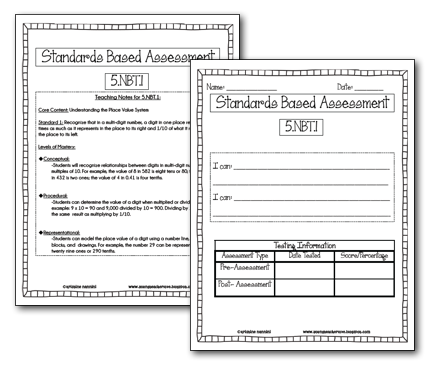 Standards Based Assessments and Teaching Notes! You can find this item here at her TpT store! 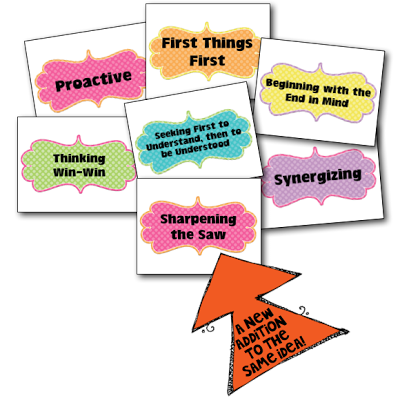 Each section is a direct fit to the Common Core Standards for fifth grade Math. I am so in love with how Miss Nannini put the standards and description at the beginning of each section. She also included the conceptual, procedural, and representational levels of mastery for each section. 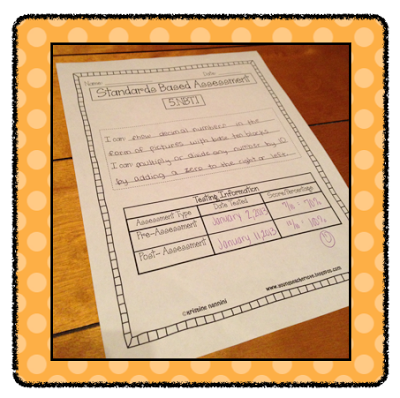 I love the pages that include the "I can" statements for the students to fill out. My students really enjoyed these statements. While they were filling them out, I realized that there is not a lot of opportunity in school for them to tell someone what they can do now that they have learned a new skill. These pages with "I can" statements were more fun that I even anticipated because we ended up in a huge discussion about all of the new things we can do now! The kids really enjoyed telling me what they feel like the are capable of now that they have mastered this section. Each section has an assessment for the students, as well. The questions are perfect for the types of questions we should be asking with the adoption of Common Core. There is also a little box at the bottom of each page to keep track of how many students are getting right or wrong. I always do this when I grade tests/quizzes, so having the box was a little detail that made me really happy! Of course, a huge reason why this unit is so complete is because of its well-made answer keys! They are so easy to use because they are minimized down to one page - well really, a half of a page! I love it! I don't have to flip through pages in order to grade the assessments. This item is even Kitty-Approved! 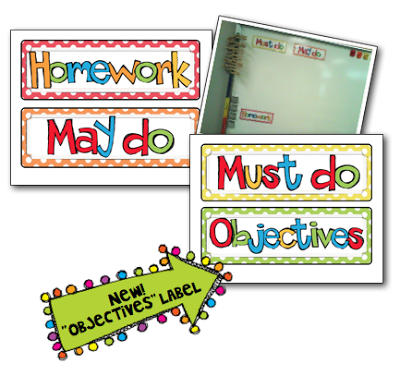 This unit goes great with Miss Nannini's Student Tracking Binder! 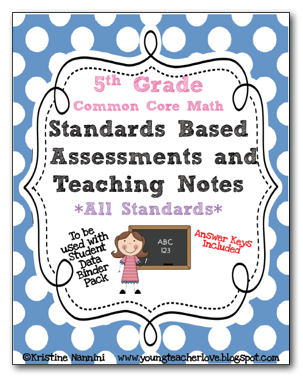 I don't have this item yet, but I have it in my cart and will definitely start using it next year with my Common Core Kiddos! 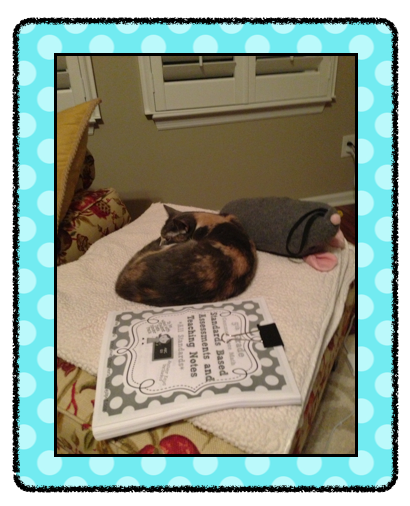 Click the picture below to get to the tracking binder at her TpT store. 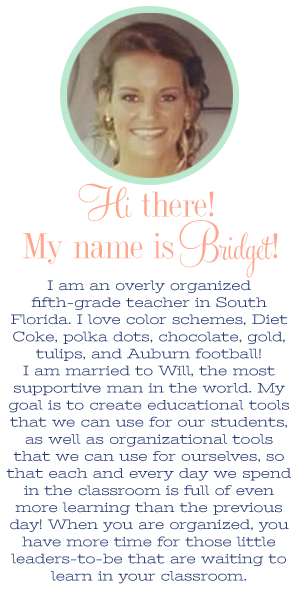 She also shares awesome info and tips about effectively and efficiently using data with your students, as in her Student Tracking Binders, here on her blog! 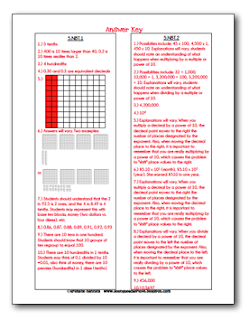 Common Core Math Hot Seats! My sister at Kindergarten Smiles sells this same product (Hot Seats) for Kindergarten and First Grade, while I have the Fifth Grade product! I added an additional printable for the board that says "objectives" because a customer requested it and I really thought that it was a great idea! 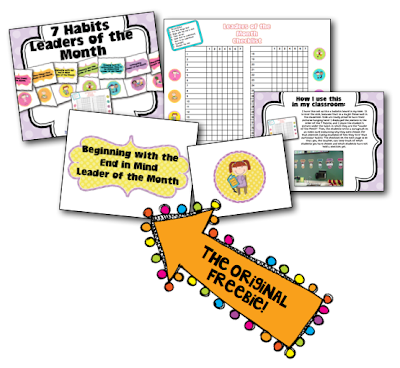 I added two different ways in which these can also be used by taking off the "Leaders of the Month" print so that you can choose to update these weekly, monthly, per quarter, or however else you decide! 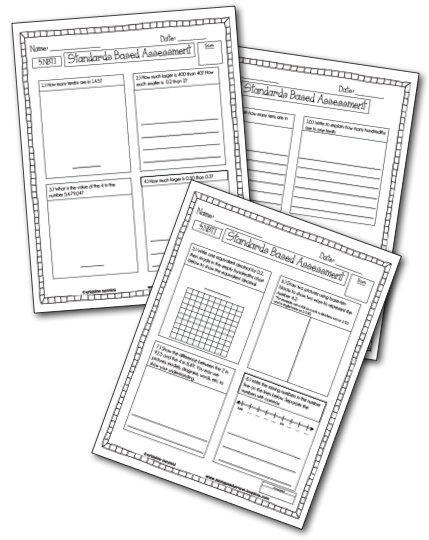 There are two new poster sets with this freebie so that you can decide which you like best! Happy Freebie!! Hopefully some of you can find great use for these items!! 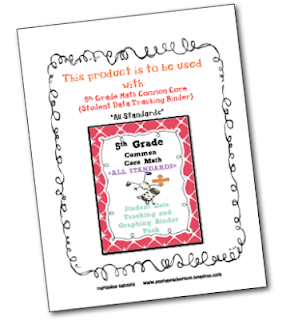 I know I love using them in my classroom!